Which manager, which technology for which community? Understanding the differences between communities within organizations is a must for grasping the value of any collaborative intelligence eco-system. 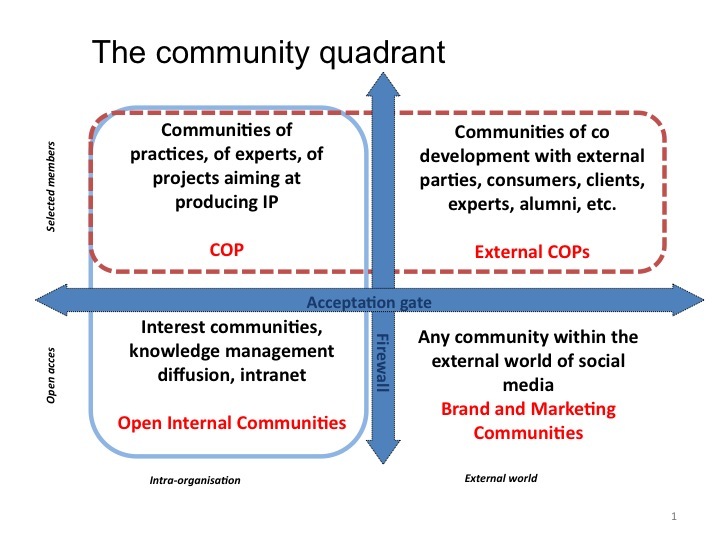 I have been working for several years now with the community quadrant diagram, published for the first time in 2007 in what was then mostly a description of communities. In the present post I would like to ouline the implications for the roles of the community managers and for the tools involved. – Is the community open to all or only to a selected few ? – Is the community totally within the firewall or is it outside (or does it allow outside members ) ? 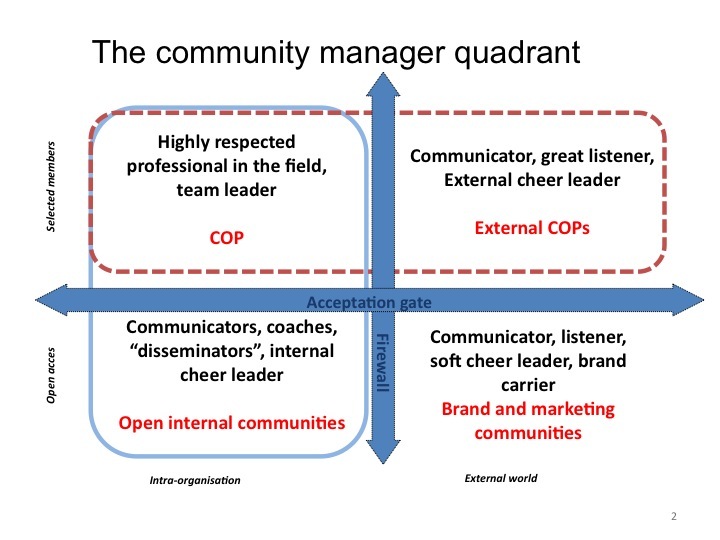 The quadrants help to clearly segment what is one talking about but more importantly it is a decisive factor for talking about the roles of the community managers, very differently structured depending on the box. As one can see these roles require different skills and different personalities. The same principle applies to collaborative tools. Depending on the box, the tools may look sometimes alike but are in fact very different because of the usages practiced and because of the functionalities requested. This matrix tend to let believe that the COP box will be dominated by large tools like Lotus Connect and SharePoint; the internal open communities box and the external COP box will require much more friendly and flexible tools i.e. internal social networks looking like the LinkedIn of today, with many links to the intranet; the external Brand and marketing communities box will have to constantly adjust to the current market’s social networks, today the Facebook and the Twitter, tomorrow increasingly a plethora of niche communities. These tools however will have, thanks to the community managers’ actions and to a number of other tools, to allow for exchanges of information in different ways. For example the marketing innovations spotted in the external communities of practice will need to be transferred to the professional COPs; vice versa the professional COPS will be required to communicate ideas and work concepts to the external COPS as well as to the Open Internal Communities. 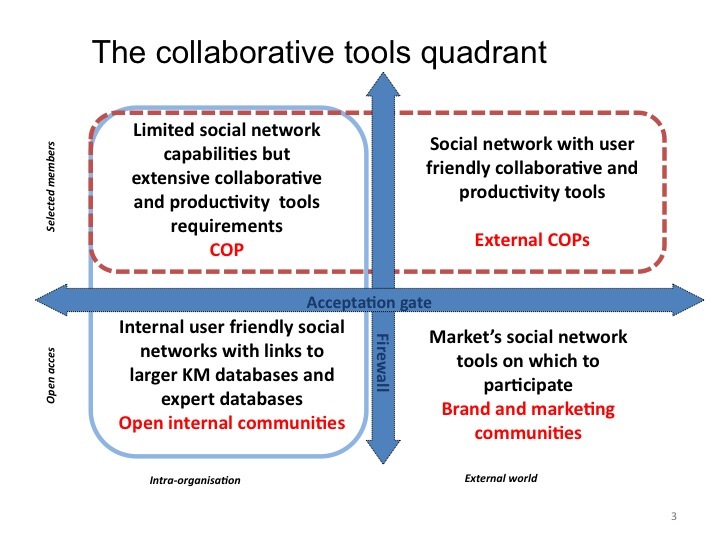 An other example will be around the Marketing and Brand communities where any discussion on social networks that could put the brand at risk (product brand, employer’s brand, corporate brand) will require rapid responses to be generated by the organization, mostly the professional COPS whenever the community manager will not have the skills or the knowledge to respond directly (the case in most crisis situations). The nature of interactions between social media and corporations becomes everyday more sophisticated. Corporate executive, finally leaving the areas of questioning and doubts, are progressively discovering that communities are a powerful productivity, innovation and engagement tool on many management fronts. The quadrant helps them to determine some of the priorities and some the choices to be made for people and technologies.